Tom Cavanaugh was back and adjusting to civil life with his grandmothers apple orchard. Tom will meet a woman but know she is not the one for him. He will keep her as a friend as he takes a look at a more sophisticated woman but he will keep looking at Nora. Nora Crane needed more work and lucked out with the apple orchard. She has an instant connection with Tom but knows it can’t happen because he is her employer. She will become friends with him even though she wants more from him. 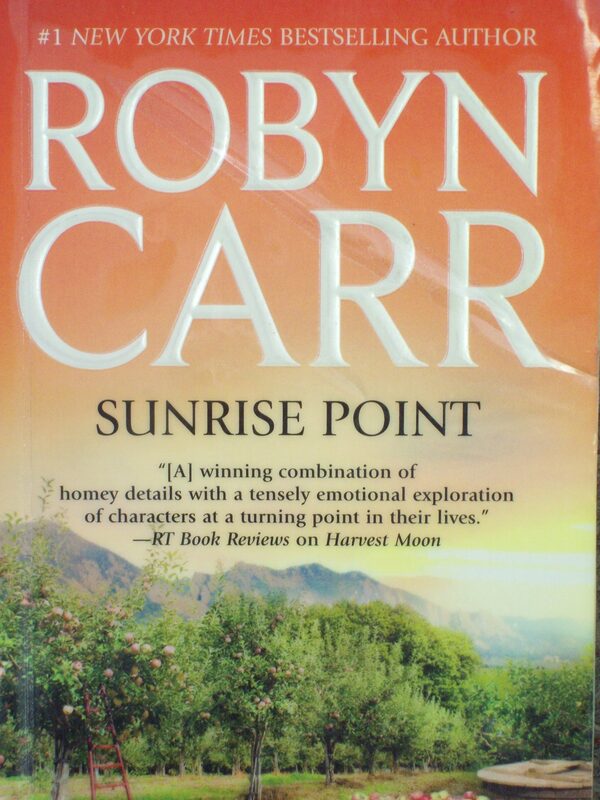 Sunrise Point is the nineteenth book to Virgin River series by Robyn Carr. I came upon this author and thought to give her a try. I picked a book that is almost at the very end of the large series. From what I can tell you can read this book on its own as its a complete story and I didn’t feel I was missing anything. I finished the book with a smile on my face but it took me a little time to get into the book. I liked the characters and it had a cute plot but I wasn’t pulled into the story. Part of it I thought was Tom’s inability to see the woman Darla who was way too superficial and I guess he was at first since all he saw was on the outside. He does get a clue but its really towards the end, but once that happens I will say the relationship between him and Nora was sweet and it blossomed into more. Nora I liked right away and how she got along with Maxie the vibrant grandmother. There were good parts to the story which lead me to finish it up and since I was smiling at the end I figured I will be back to Robyn Carr. Maybe I will try out the first book to this series to see how it all began or just grab another from the series, which ever is more available.